Decorating with container gardens is the easiest and most popular way to use them. 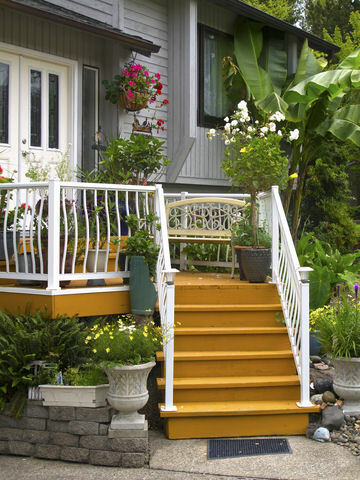 Potted gardens can bring a plain, stark deck, balcony or patio to life. If your gardening goal is to add decor to your outdoor living or entertaining areas, you are absolutely in luck. 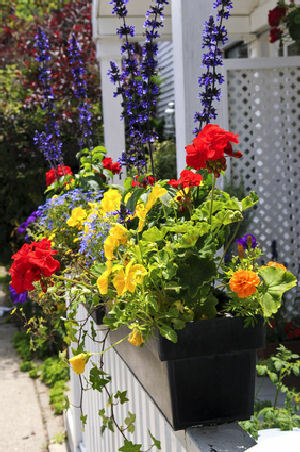 Container gardens allow us to set, hang or mount a garden basket, pot or box almost anywhere. We can add instant color and impact with a container garden. 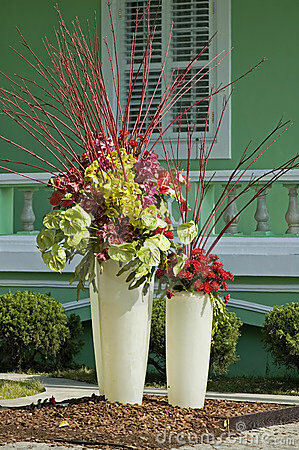 Designing container gardens with decoration only in mind is pure enjoyment. Container gardens are a welcoming display on your front porch, and a popular way to adorn your front door and entry area. The home above has no room for large containers at the front door. 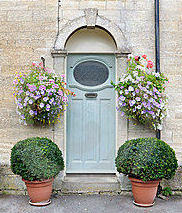 Instead, two small shrubs flank the door, and the urn of colorful flowers is moved to the right of the steps. 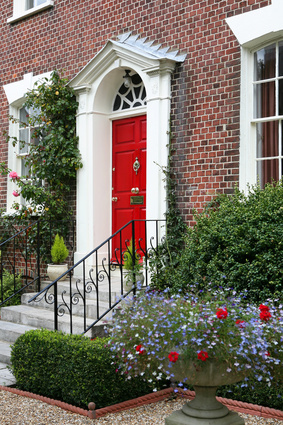 With red to complement the door, this container creates a beautiful focal point in the whole entrance area and gives the home great curb appeal. 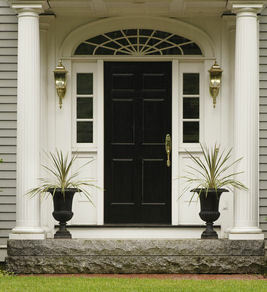 This home’s entry is directly off the street, but that doesnt keep the owner from creating a welcome entry. The hanging baskets of petunias in the pale purple and pink complement the blue/gray of the door while neat boxwood shrubs provide year’round appeal. Scale is key to successful decorating with container gardens – make sure your container garden complements its location. 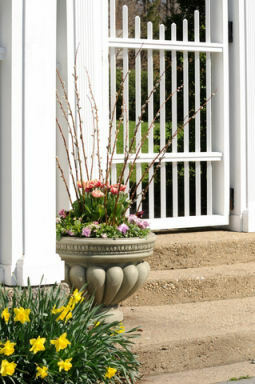 When decorating with container gardens, they should be on the same scale as the fixed structure at which you place them. Two small pots of flowers on either side of a large door or wide expanse of front stoop will look worse than nothing at all. Don’t dominate an area with your container gardens – you certainly don’t want to impede entry or exit, but make sure your containers have an impact. The front porch above isn’t big, but urns at the bottom of the steps, small potted trees and shrubs, as well as a hanging basket all work together to create a nice welcome. They bring color to what appears to be mostly foliage plantings around the house. Don’t those gold steps pop? Don’t forget the back door either – they say that “back door guests are best”. 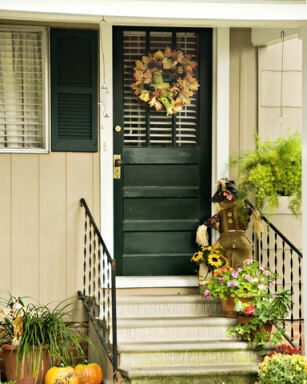 You may not have as much room at your back door, but create a welcoming entry for your family and friends there too. Above, the backdoor look is informal and relaxed. Grouping pots with single plants near an entry makes it convenient to trade out plants with the seasons. Make sure the grouped containers have something in common – material, color, shape, etc. Don’t leave your favorite urn empty in the winter. Fill it with cuttings from holly or evergreens like spruce or pine. Top that with ornamental leaves – maybe magnolia – and then arrange fruit on top. If you use real fruit, bring it inside during freezing temps. A pineapple looks great in the middle with apple, pears or oranges around it. Use pine cones, berries, or anything else you like. At your entry, and any where else for that matter, decorating with container gardens doesn’t have to mean pots or boxes that sit on the floor – move them up, and if you have room, you can do both. 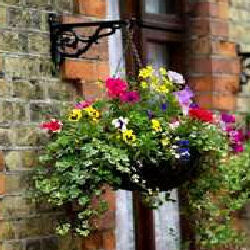 If you just have a small stoop or front door that opens immediately off the sidewalk or street, try hanging baskets from an awning or overhang if you have one. 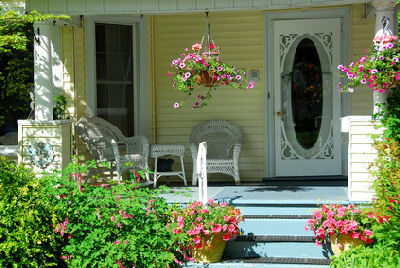 If not, use a half-basket or hanging planter that will attach directly against the outside wall. Place one to the side of the door where it opens, or use one on both sides – depending on the room you have. If you have a window nearby, try a window box as well. They all say “welcome” and will set your home apart from others along the way. Potted flower and foliage can be placed on outdoor tables, along deck and porch rails and at the base of stairs or steps. Decorate your balcony and enjoy the colors of your garden from inside your home too. 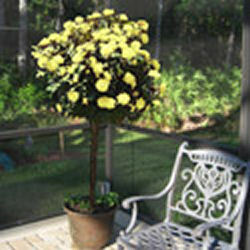 Many houseplants will do well outdoors in the summer. You may even want to mix them with outdoor plants in containers. Most will prefer shade or partial shade. As you bring them outside, keep them in a shady location at first and gradually move them to an area with more sun if you want to. You don’t have to make containers with lots of different flowers or foliage, or create an impressive design to have them make a statement and provide beautiful color to your outdoor areas. Single plantings can be very nice, either alone or grouped together. From left: dianthus, hosta, coreopsis and geranium.